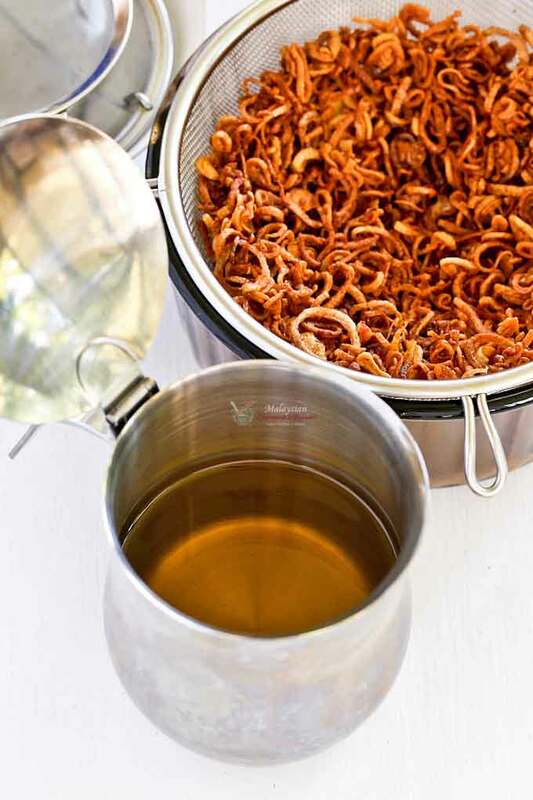 A tutorial on how to make Crispy Fried Shallots and Fragrant Shallot Oil, a popular condiment in Chinese cooking. It is a must-have in a variety of dishes! 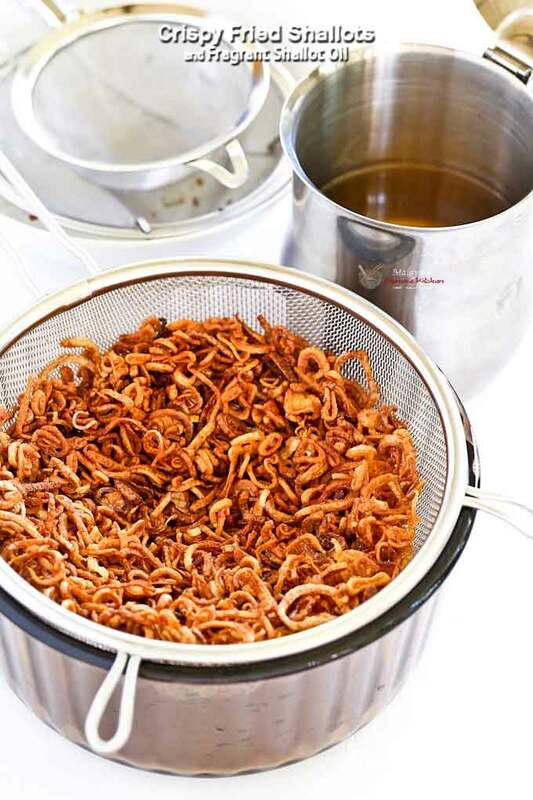 Crispy Fried Shallots is one of the most used and popular condiments in Chinese cuisine. Most Chinese kitchens have a jar of it in their pantry. You see it in stir fries, rice dishes, meat dishes, noodles, and just about everything in between. Back in the old days, Crispy Fried Shallots were homemade. 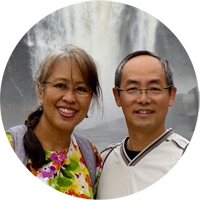 Today, you can purchase them in plastic containers at most Asian grocery stores. Many people buy them out of convenience but store bought fried shallots are not as light and tasty as homemade fried shallots. Crispy Fried Shallots are not difficult to make. 90% of the work is in peeling and slicing the shallots. Once that is completed, the frying is easy. You just have to make sure the sliced shallots do not burn in the hot oil. The cooking time given is just an approximation. It really depends on how much shallots you are frying at one go and the temperature of the oil. If you are frying just a few shallots and your oil is very hot, it is going to take a shorter time. Always use sufficient oil and medium low heat for better control and even cooking. As soon as the fried shallots turn a light brown color, it is time to remove them from the pan. Fried shallots will continue to brown even after they are removed from the hot oil. If you wait until they are golden brown in the hot oil, they will be burnt when cooled. Peel shallots. Then rinse and drain in a colander. Cut each shallot cross-wise as thinly as possible. Heat vegetable oil in a wok or a saucepan over medium low heat. Drop a slice of shallot into the hot oil to test if it is sufficiently hot. If it is, add all the sliced shallots. Stir gently to brown evenly. Depending on the amount of shallots being fried, it takes anywhere between 10 to 15 minutes for the shallots to brown. As soon as the shallots turn a light brown color, remove them from the hot oil into a metal strainer. Shallots will continue to brown to a golden color. Strain the oil into a jar when it is cool enough to handle. 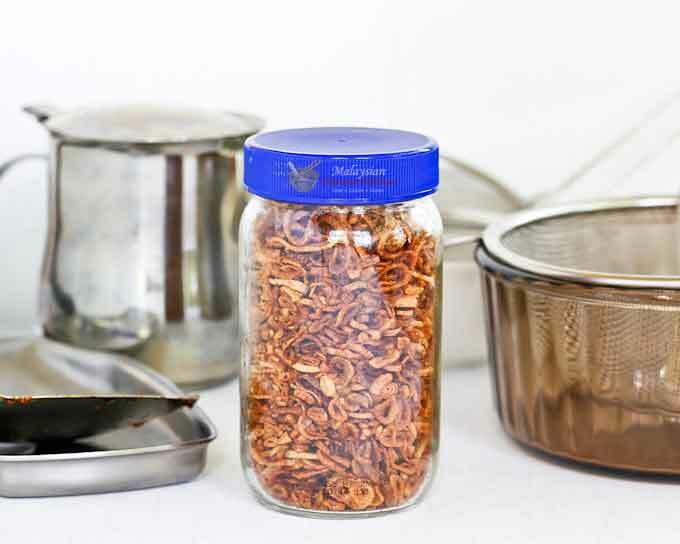 Allow fried shallots to cool completely before storing in air tight jars. Use within a month. Be patient! 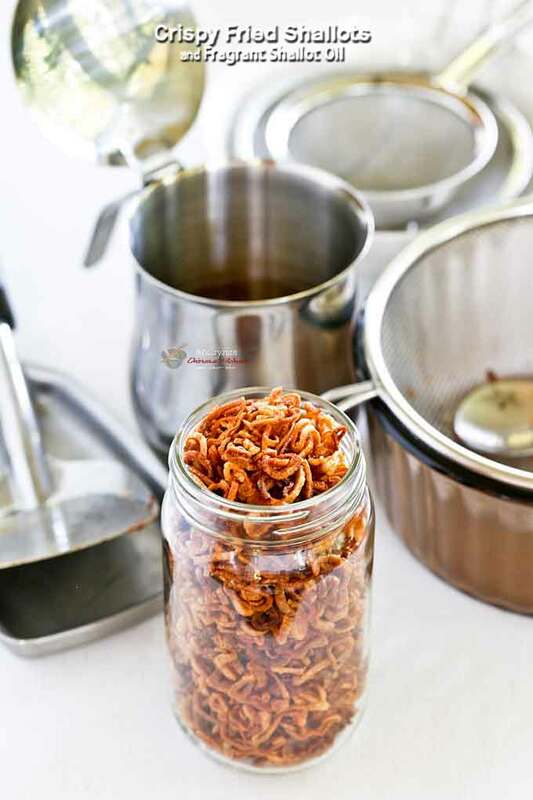 Always strain the fried shallots well and allow them to COOL COMPLETELY before transferring to airtight jars. They should be nice and dry, not dripping with oil. If done properly, they should last for about a month.